Well we’re off my friends. 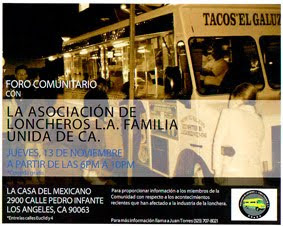 The great 30 taco trucks in 30 days challenge. It’s not much of a challenge really. I have no problem eating this many tacos. The only problem I know I will encounter is sitting down and writing about it. Sometimes the words come and sometimes they don’t. Right now I feel kind of tired and a bit drab. I think I’m lamenting the end of summer. 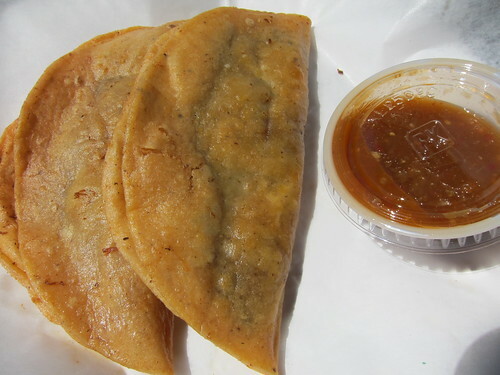 Well I kept getting emails about Tacos El Compita, a taco truck near the Smart and Final in Downtown LA that makes great tacos dorados and it occurred to me that I’ve never done a taco dorado review on this blog. 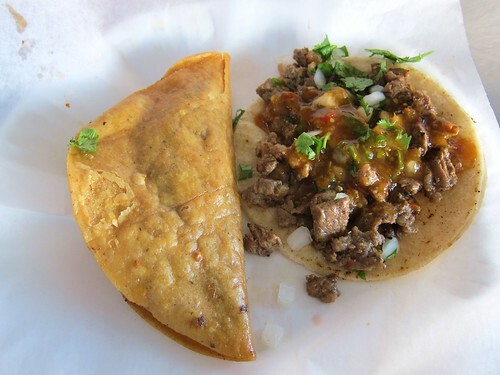 I love hard shell tacos as much as the next gringo but there’s some debate if this kind of taco can even be described as Mexican food. Is the hard shell gringo taco really just American food? Anyways the dorados at El Compita are a little different. These are not your gringo hard shell tacos. The taco shell and the shredded beef are fried together. There’s no filler like yellow cheese or lettuce. They are called dorados barbacoa but they are beef, not goat. 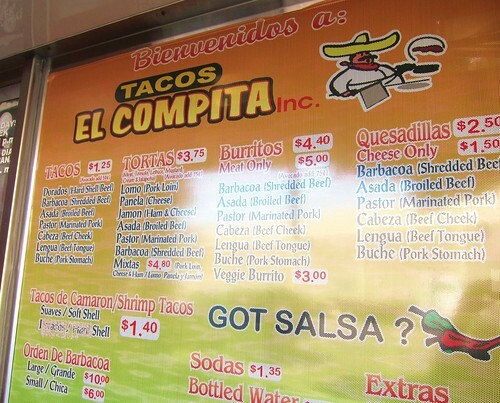 Tacos El Compita also has a full menu of soft tacos but the dorados are what most people were ordering. I first started with one dorado and one asada taco. The asada was serviceable, there were no loose bits of fat or gummy tendon but the flavor of the asada was a little on the bland side. Then I bit into my first dorado. It was crunchy, chewy and delicious. The flavor was in the shredded beef which was crispy at the edges and soft in the middle. I gently opened the taco wary not to break the shell and I poured a little salsa roja into the dorado. It gave the taco a little extra kick and added another flavor. I ordered another dorado and the taquero handed me a plate with two dorados. Before I could say anything the taquero said that it was his last two dorados. For a minute I thought he recognized me as a taco reporter and was trying to influence my review. I thanked the taquero and complimented him on his excellent dorados. 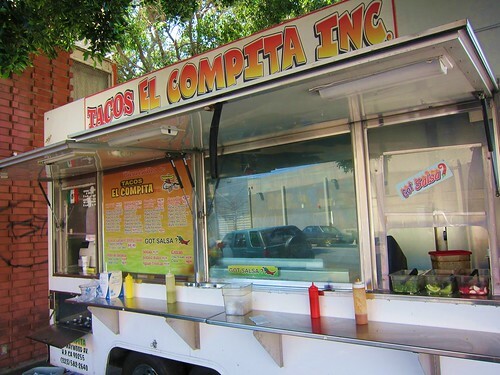 Tacos El Compita is a daytime truck that does business as early as 8:30 am with the last dorado served before 3pm. Between noon and 1pm expect a wait as local workers from Smart N Final and the industrial factories in the area break for lunch. Best time to go? Right before they close. You might get a free dorado! Beautiful golden dorados! If you ever find yourself in Santa Cruz, be sure to try the crispy tacos at Las Palmas Taco Bar, they are the best I have ever had. I am impressed by your ambitious September project. You will enjoy eating, and we will enjoy reading. And I hope you enjoy writing. Godspeed on your project Bandini! So jealous. So glad you tried them. I mentioned them on your news feed box that you had on your site. They have 3 sauces so you'll have to play around, my fave for dorados is the orange bottle.